Wisdom teeth are often first seen on x-rays conducted during regular appointments at our Boerne dental office. Most often, we can see them as they’re beginning to erupt through the gums. It’s also when we’re most likely to recommend that they be removed. In fact, about 90% of Americans get their wisdom teeth taken out. But why can’t they just stay there? The #1 reason wisdom teeth need to be removed is that there isn’t enough room in your mouth for these four back molars, or “third molars,” to fit. We can typically tell if this will be factor from your x-rays. This is one reason regular visits to your dentist in Boerne are so important. If your wisdom teeth erupt and there’s no room in your mouth, they can become “stuck” in your bone. When this happens, your wisdom teeth are referred to as being impacted. 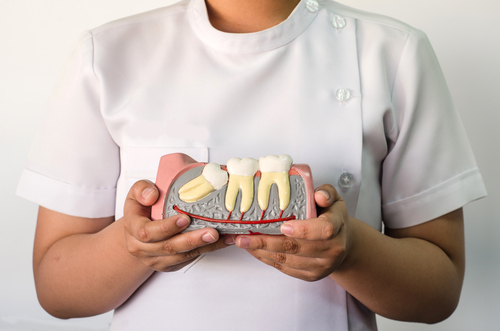 Surgery to extract impacted wisdom teeth can be more complicated, so it’s best if we avoid it by catching any potential problems and removing the teeth early. Regular visits at our dental office in Boerne help get and keep your mouth healthy and can also catch any potential problems with your wisdom teeth before they arise. If your wisdom teeth are already causing pain, or removal wasn’t recommended in time before they erupted, call to schedule your appointment today. We’ll make sure to recommend the best option for you and your wise molars. Serving patients in Boerne, Fair Oaks, The Dominion and beyond. Having sensitive teeth can be brutal. The sharp, shooting pain that often accompanies tooth sensitivity can put a damper on enjoying favorite foods. At our dental office in Boerne, we don’t want any of our patients to suffer from sensitive teeth, but we understand that a lot of them do. 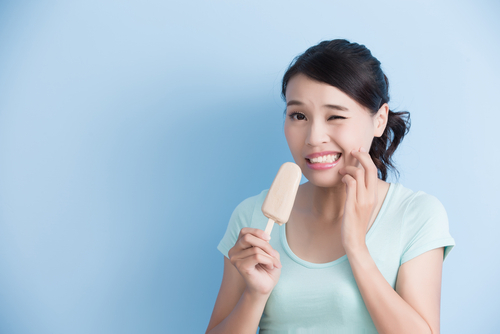 We’d like to explain some of the most common causes of tooth sensitivity and talk about some possible remedies. Certain foods can directly affect oral health. We all know that sugary foods can eat away at tooth enamel and lead to cavities, but acidic foods can also cause some dental problems. A diet packed with acidic treats like citrus fruit, tomato sauce, and wine also causes enamel erosion and weakened teeth. Once the middle part of the tooth known as the dentin becomes exposed, teeth can become painfully sensitive. That’s right, your dentist in Boerne just said there’s such a thing as too much brushing. While we encourage our patients to brush, we don’t want them to cause damage by doing it. Damage from over-brushing can be caused by either doing it too often or using a rough, scrubbing technique. You should use a soft-bristled toothbrush two times a day in soft, gentle circles to protect your grin against sensitivity. We typically recommend flossing about once a day, every day, and for good reason. If you only brush your teeth, you’re not cleaning two sides of each tooth which can lead to plaque buildup. Plaque that’s not removed by regular brushing, flossing, and professional dental cleanings can damage enamel and leave teeth feeling a bit sensitive. Grinding tooth against tooth is a great way to not only cause chips and breaks that will require restorative dentistry to fix, it’s also a top contributor of sensitivity. Grinding files down the enamel which, as we know, leaves the inside of the tooth exposed. Usually a bruxism mouthguard can be custom fitted to prevent grinding and damage that comes with it. If you’re experiencing the pain associated with having sensitive teeth, you don’t need to continue to suffer. Call our Boerne dental office to schedule an appointment and get relief. Accepting patients from Boerne, Fair Oaks, The Dominion and beyond.